American Indians learned about playing cards from the Spanish, whom they saw using brightly coloured paper cards imported from Spain or manufactured in Mexico. They quickly adopted the gambling games they were used for. 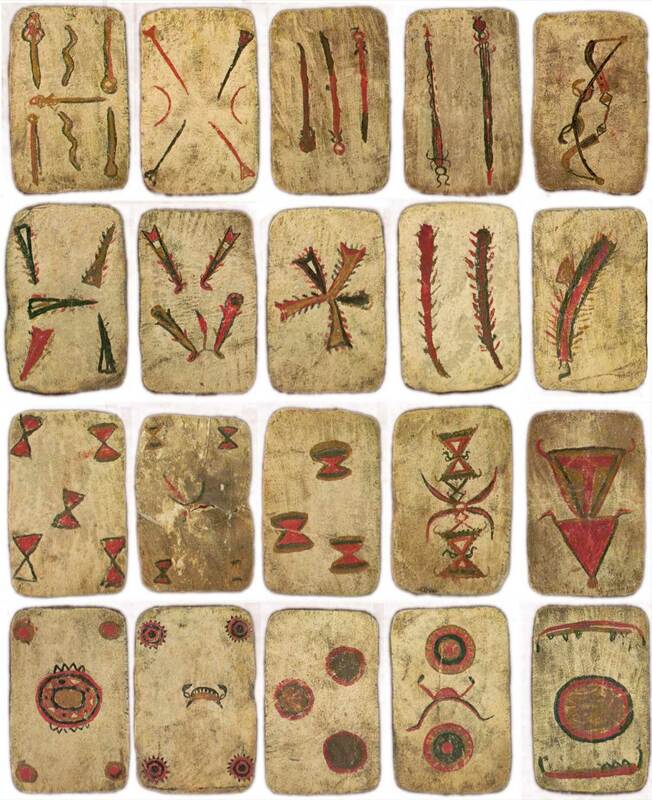 Apache Indians made their own playing cards on rawhide when supplies of printed cards were not available from Mexico. Apache artists were largely self-taught without any formal instruction. Spanish designs were adapted into Apache-style artwork, with Apache motifs, based on their interpretation of the Spanish cards. The Indian artists modified those features which were outside their cultural heritage. The cards shown here were first purchased in 1875 from an Apache woman, but they were already in a worn condition with scuffing and soiling through use so presumably had been made sometime before then. Right: Apache Playing Cards from the Wayland Collection published in 1972 by H & V Wayland, Pasadena, California. Illustrated again in Ferg (2006) where it is noted that the cards were acquired by the Arizona State Museum, ASM accession 2006-113. Apache men always had paints available to paint their bodies. The drawings are skilfully executed with a fine balance of colours red, black, brownish-yellow and green. The four kings, or ‘Reyes’, wear crowns and have ornamented robes and necklaces in a style more familiar to the Indian way of life. The four ‘Caballos’ are dramatically depicted as Mexican horsemen or bandits wearing hats, mounted on horses tittuping on red and black hooves. The four ‘Sotas’ have high-heeled shoes, tightly fitting trousers, long coats with tails and appear to have mohican hairstyles or pig-tails. 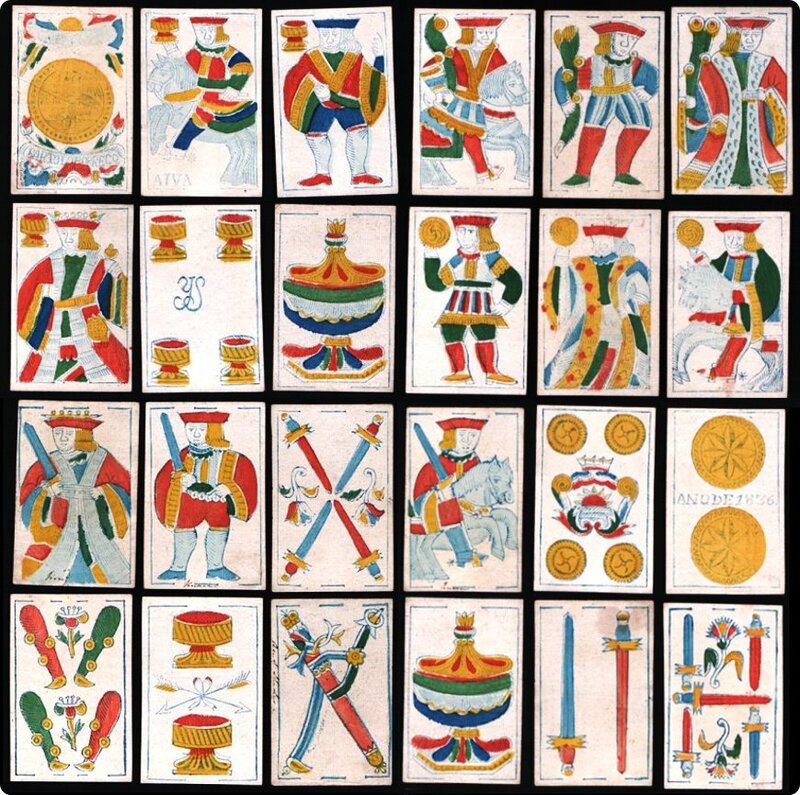 These cards can be seen as a unique folk-art genre of playing cards. The figures on the cards give us an insight into the American Indian point of view of the Mexican and American outsiders who were settling the west in the second half of the XIX century, as well as seeing how the designs have been adapted into their own cultural idiom. Wayland, Virginia: Apache Playing Cards from the Wayland Collection, Wayland Playing Card Monographs No.3, privately printed by H & V Wayland, Pasadena, 1972. See example of Mexican pack from 1830s which might have served as a prototype. Above: the numeral cards 5, 4, 3, 2 and Ace. The full deck also contains sixes and sevens in each suit, total = 40 cards. In the early 19th century Mexican ranchers pushing up from the South and American settlers pushing in from the East gradually took over Indian territory and threatened their way of life. The first explorers, trappers, traders and settlers usually described Apaches as friendly, highly intelligent, independent and living nomadically as small family groups. As they were pushed into the mountains in what is now south-west New Mexico, southeast Arizona and the northern part of the Mexican state of Sonora, from around 1840 onwards many of the Apaches decided to fight for their livelihoods. 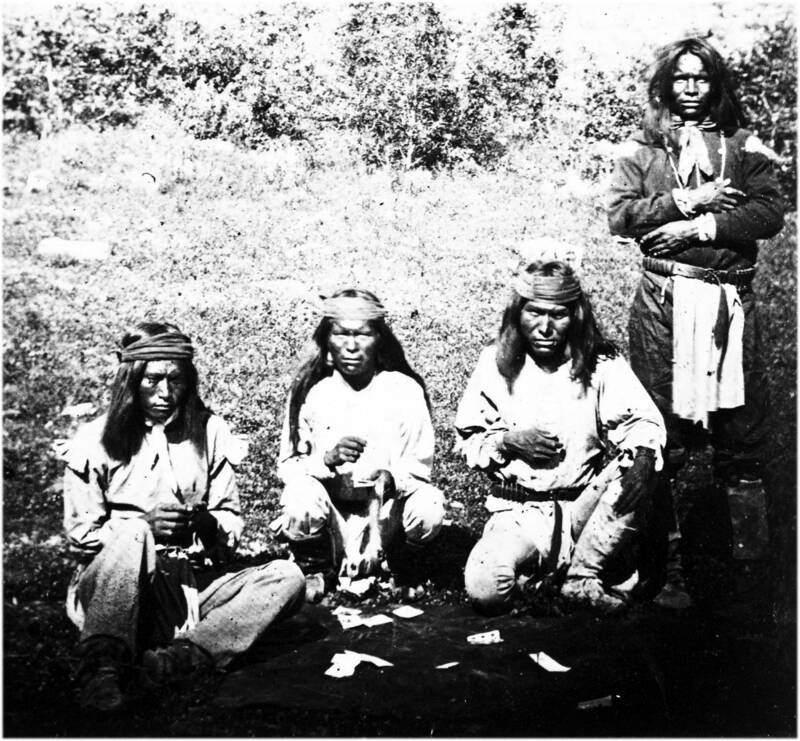 These Apaches did not have any paper, so skin proved a highly suitable substitute to make their playing cards. Other Apache groups were more peaceful and lived close to American army forts where they played a great deal of cards for recreation and excitement. They also became reckless gamblers.